Leading Pauline studies expert Thomas Schreiner provides an updated guide to the exegesis of the New Testament epistles traditionally assigned to Paul. 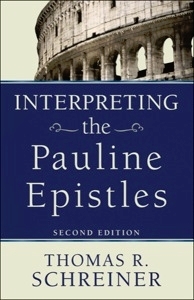 The first edition of Interpreting the Pauline Epistles helped thousands of students dig deeper into studying the New Testament epistles. This new edition is revised throughout to account for changes in the field and to incorporate the author’s maturing judgments. The book helps readers understand the nature of first-century letters, do textual criticism, investigate historical and introductory issues, probe theological context, and much more. About the Author(s): Thomas R. Schreiner is the James Harrison Professor of New Testament Interpretation at The Southern Baptist Theological Seminary in Louisville, Kentucky. He has also taught New Testament at Azusa Pacific University and Bethel Theological Seminary. He received a B.S. from Western Oregon University, a M.Div. and Th.M. from Western Conservative Baptist Seminary, and a Ph.D. in New Testament from Fuller Theological Seminary. He has published a number of articles and book reviews in scholarly journals. His published books include: Interpreting the Pauline Epistles, The Law and Its Fulfillment: A Pauline Theology of Law; Romans; Women in the Church: A Fresh Analysis of 1 Timothy 2:9-15, co-edited with H. S. Baldwin and A. Kostenberger; Still Sovereign: Contemporary Perspectives on Election, Foreknowledge, and Grace, co-edited with B. A. Ware; The Race Set Before Us: A Biblical Theology of Perseverance and Assurance, co-authored with Ardel Caneday, Paul, Apostle of God’s Glory in Christ: A Pauline Theology; New Testament Theology: Magnifying God in Christ. He is also the preaching pastor of Clifton Baptist Church in Louisville, Kentucky. He is married to Diane Elaine and they have four children: Daniel, Patrick, John, and Anna.